During an interview with Egypt's CBC channel on Tuesday, Palestinian President Mahmoud Abbas spoke about Hamas' involvement in ongoing operations carried out by militants in Sinai. Although Abbas (Abu Mazen) revealed that he had received information about connections between the Gaza-ruling Islamist movement and security unrest in Sinai – which spiked after the 30 June protests that led to the ouster of Muslim Brotherhood-affiliated president Mohamed Morsi – he argued that only the Egyptian judiciary is authorised to say whether Hamas is guilty or not. "The [Palestinian Authority] PA has information about this issue, and we were keen to provide the Egyptian side with it," he said. Abu Mazen described the tunnels leading to the Gaza Strip from the Egyptian border city of Rafah as "illegal," adding that they were an immensely profitable "business" for the 1,800 millionaires in Gaza who smuggle "everything" from cigarettes to rockets, from drugs to counterfeit money machines. While he urged Cairo to destroy the tunnels, the Palestinian president also mentioned "putting the humanitarian needs of the Palestinian people into consideration," and pointed out that although the PA does not rule the Gaza Strip, it contributes 58 percent of the Strip's total budget. On 4 October, Egypt's border guard head Major-General Ahmed Ibrahim announced that the Armed Forces had demolished 794 tunnels since the beginning of the year amid a security crackdown on militant activity in the restive peninsula. Ibrahim added that security forces had destroyed a total of 1,055 tunnels since January 2011, following the revolution that toppled the Mubarak regime. He went on to add that the Armed Forces – with the help of military intelligence – have begun combing over 13 kilometres along the Rafah border with "enhanced equipment" capable of detecting underground tunnels. The president noted that Egypt plays the most pivotal part in the Palestinian cause and reconciliation, and called for the restoration of the country's traditional role. "We appreciate Egypt's preoccupation with its internal politics, but things will return to normal within a month or so," he stated. Fatah and Hamas, the two strongest Palestinian factions, reached an Egyptian-sponsored unity agreement in April 2011, although its main articles have yet to be applied. In December 2012, leaders of Hamas and Fatah called for the renewal of reconciliation attempts that had then been stalled for over a year. The deal had intended to pave the way for presidential and legislative elections by May 2012, but disagreements over a number of political arrangements snarled its implementation. Although Abbas stated that Hamas had come to agree with Fatah on the right of return and Jerusalem as the capital of the Palestinian state based on the pre-1967 borders, he accused Hamas of ignoring the Palestinian-Israeli conflict, stating that "Hamas leader Mahmoud Al-Zahar told me 'Jerusalem is not Mecca' when Israel refused to hold Palestinian elections in Jerusalem." Pertaining to peace talks with Israel, he assured that negotiations would continue for nine months with European, American, Arab and Islamic support for a comprehensive solution, "unlike previous periods," in order to resolve all disagreements. Abbas, who said he perceived the 30 June events in Egypt as motivated by "full popular will that the military interfered to impose," said that he had attempted to communicate with different US and European officials on the matter. According to Palestinian news agency Sama, Abbas said US Secretary of State John Kerry asked him during their Thursday meeting in Ramallah to convey his greetings to Egypt's army chief General Abdel-Fattah El-Sisi. "The impression I had after meeting El-Sisi was that he is a great leader who cares about his work," the Palestinian president said. The same agency also said Abbas mentioned that the peril imposed by Hamas had only become fully recognisable after the collapse of the Brotherhood regime in Egypt. The London-based Al-Hayah newspaper reported a statement by Abbas on Tuesday in which he mentioned a dialogue with Morsi during a previous Cairo meeting. 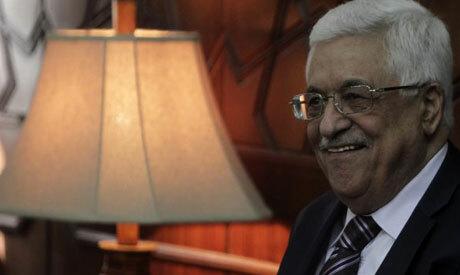 Abbas said he had warned Morsi against Israel's attempts to terminate all Palestinian attempts for statehood. "When I told Morsi that about 1.5 million people lived in Gaza, I was surprised [when] he sarcastically said 'we can bring them all to Shubra' [a large district in Cairo]," the newspaper quoted Abbas as saying. Abu Mazen is an illegal president yet he is unashamed. He should step down and call for elections to elect a President of Palestine. Traitors love traitors. They have betrayed the palestinian and arab cause a LOOOOONG time ago. Part of the secular corrupt! Both the coup junta in Egypt and abbas's party in palestine are loses at the ballot box. They know fully well that the majority of the Egyptian and Palestinian people will support the Islamist, MB and Hamas, therefore, they ganging up to destroy them with oppression, lies, unlawful arrests, fabricated evidence and mass murder. They must realise that they are fighting a losing battle and will soon meet their fate, just as the pharaohs of the past did. What COWARDS!! !